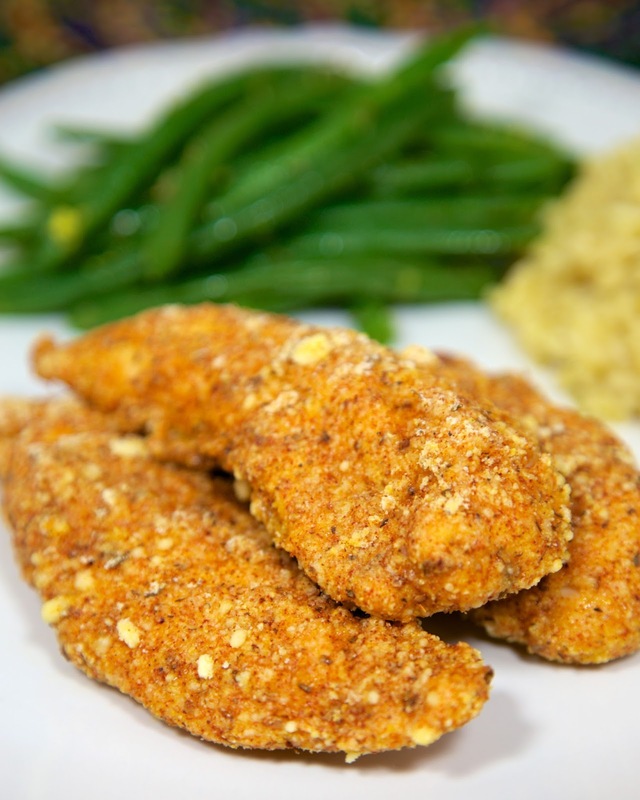 Cajun Cornbread Crusted Chicken Tenders - only 5 ingredients! Chicken, Jiffy mix, cajun seasoning, flour and eggs. Control the heat by adjusting the cajun seasoning. Baked not fried! Ready in about 15 minutes! It's Mardi Gras! Well, it's almost over. Fat Tuesday is next Tuesday. I actually went to Mardi Gras, in New Orleans, when I was in college. Let's just say it was an experience. I saw things I had never seen before or since. I'm glad I went, but I vowed to never go back! Now, I love cajun and creole food. We went to New Orleans a couple of years ago (not during Mardi Gras) and had a blast! We went to a cooking class, did a swamp tour and ate a ton of great food! I want to go back this year. There are so many things I still need to visit, eat and drink! 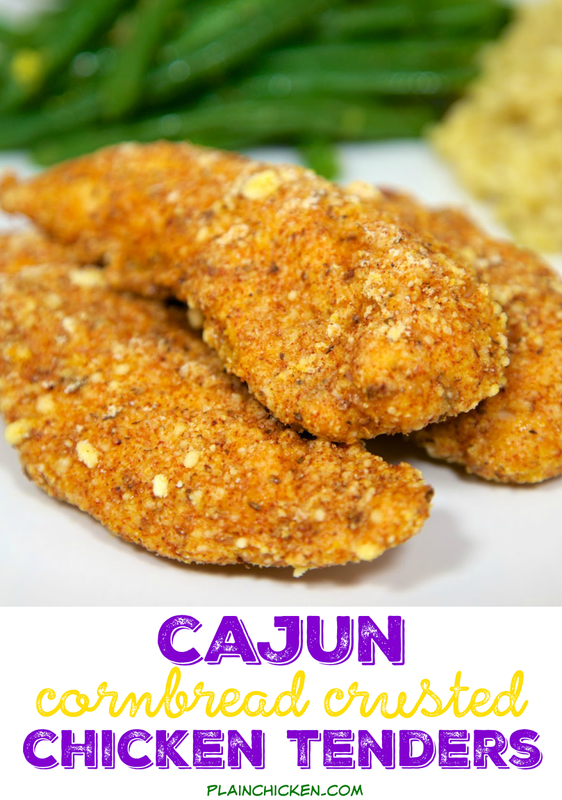 These Cajun Cornbread Crusted Chicken Tenders are perfect for your Fat Tuesday celebration next week. They are super simple. They start with a box of Jiffy mix and some cajun seasoning. You can control the heat in these by adjusting the amount of cajun seasoning. 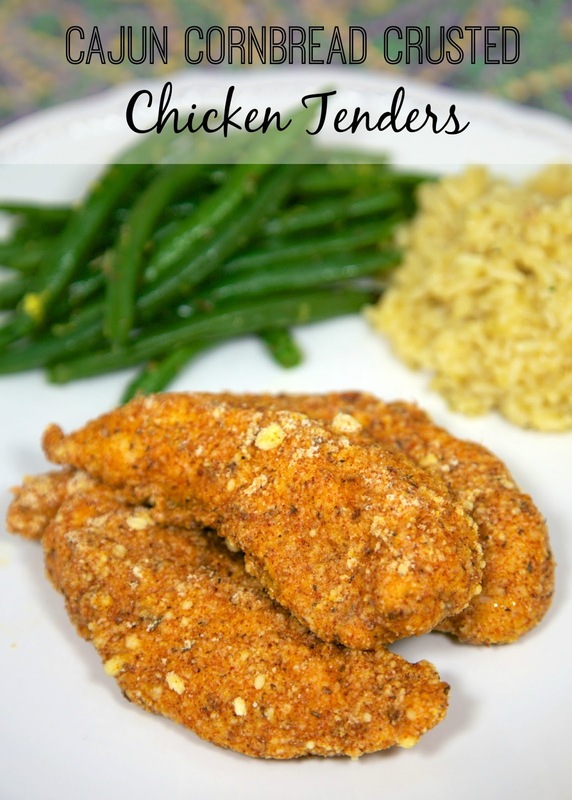 I baked these chicken tenders because it is easy and I don't like messing up the stove by frying stuff. Serve these with a side of pasta, my Creole Green Beans and let the good times roll! Place flour in a shallow pan or plate. Whisk eggs and place in another shallow pan or plate. Combine cajun seasoning and cornbread mix. Place on shallow pan or plate. Coat chicken in flour. Shake off excess. Dip in egg. Coat in cornbread mixture. Place on baking sheet. Repeat with remaining chicken tenders. Lightly spray chicken with cooking spray. Bake 15 minutes, until juices run clear. I have a question for you. Did your crust turn out crispy once you pulled them from the oven? When I pulled mine just now, it was kinda soggy. =/ The flavor is quite excellent, but I was a little disappointed with the texture of the crust. My tenders weren't soggy. I cook them on a baking stone. You can also try cooking them on top of a baking rack. That way there won't be a lot of moisture for the tenders to bake in. what brand of cajun seasoning did you use?